In Jordan, where Palestinians comprise two-thirds of the population, a gender-biased nationality law forbids Jordanian women, but not Jordanian men, from passing their citizenships to their children. In this talk, I present archival evidence that dependent nationality originated during the British Mandate for Palestine and not, as is widely believed, from The Qur'an. Citing national security, Jordan, uses dependent nationality to close paths to Jordanian citizenship to preserve Palestinians’ “right of return” to a future Palestine. The state has relied on discourse of tradition and Islam to contrast Palestinian -Jordanians to East Bank Jordanians, who are produced in turn as “exceptional citizens.” Saving the security state requires exceptional Jordanians to keep Jordan for Jordanian-Jordanians. Given the colonial and postcolonial ordering of the Middle East conflict, East Bank Jordanians rearticulate their exceptionality by conflating colonial legacies of sexual control with religious discourses about the sacred. In detail anxieties about citizenship, marriage/polygamy, and so-called "undesirable women" surrounding the 1925 Order-in-Council that introduced dependent nationality to the Middle East, I provide a counter-narrative to the local and global debates that see dependent nationality as emanating from Islam. I argue that marriage and sovereignty have been intertwined in how ethnosexual difference in Jordan is situated in colonial vocabularies of “palestinism,” which I theorize in terms of racialized citizenship. 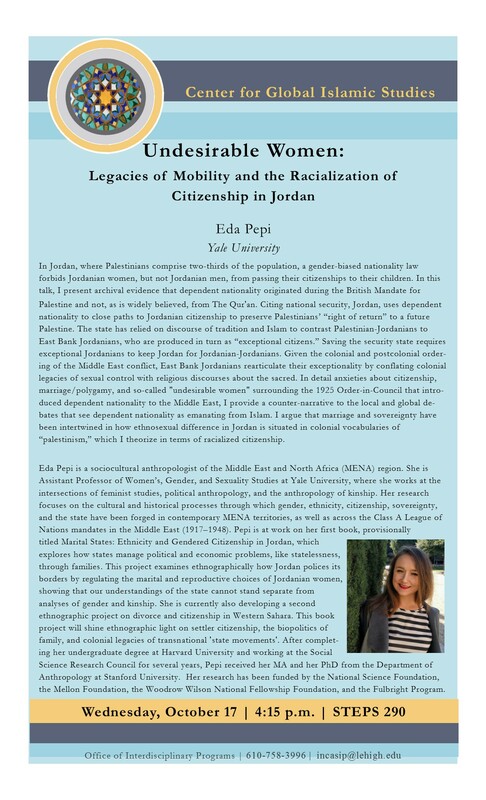 Eda Pepi is a sociocultural anthropologist of the Middle East and North Africa (MENA) region. She is Assistant Professor of Women’s, Gender, and Sexuality Studies at Yale University, where she works at the intersections of feminist studies, political anthropology, and the anthropology of kinship. Her research focuses on the cultural and historical processes through which gender, ethnicity, citizenship, sovereignty, and the state have been forged in contemporary MENA territories, as well as across the Class A League of Nations mandates in the Middle East (1917–1948). Pepi is at work on her first book, provisionally titled Marital States: Ethnicity and Gendered Citizenship in Jordan, which explores how states manage political and economic problems, like statelessness, through families. This project examines ethnographically how Jordan polices its borders by regulating the marital and reproductive choices of Jordanian women, showing that our understandings of the state cannot stand separate from analyses of gender and kinship. She is currently also developing a second ethnographic project on divorce and citizenship in Western Sahara. This book project will shine ethnographic light on settler citizenship, the biopolitics of family, and colonial legacies of transnational 'state movements'. After completing her undergraduate degree at Harvard University and working at the Social Science Research Council for several years, Pepi received her MA and her PhD from the Department of Anthropology at Stanford University. Her research has been funded by the National Science Foundation, the Mellon Foundation, the Woodrow Wilson National Fellowship Foundation, and the Fulbright Program.